I think it was because I was typing a long reply - maybe 10 minutes or so. For sure I'll let you know if anything else goes awry. Yup, basically if we start off with the ANH stunt, the hero is basically just a separate helmet and additional rivets to hold the holster in place. 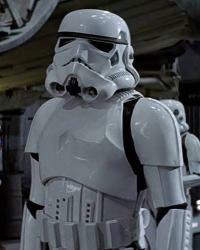 EBS is also a different helmet, different holster, blaster, and hand guards. You can look at the CRLs that are online easily enough. ROTJ is a very different beast! Kudos kudos - time to double your pay web dudes! Thanks Eric and Mathias for making this happen! It feels faster already. Daetrin replied to Daetrin's topic in Getting Started - Read this First! That wouldn't be a problem at all. Honestly, that's what a lot of people do with overseas merch - at least that was my experience when people did patches. Easier to ship 20 or 30 to one address in say Germany and then they can just distribute them much more cost effectively locally. I have an idea of coin numbers, but am still working to get patch numbers. They took a vacation lately so I'm hoping to square this away this week for everyone, e.g. what is left. They are all in the for sale area. Two different coins (FO Riot Trooper and Phasma), plus a bunch of patches. Aside: your sig banter is one of the best I've ever seen! It certainly is #1 on the list, but we still have a ton load of coins/patches left over from previous runs we're still trying to dig out of. No point in creating more stuff until the stuff we already have clears out. For the baton, I see no evidence that it has to be telescoping, and agree that it's most likely the one like the patrol trooper. I'd like to udpate the CRL to reflect this, and also allow cordura for the hoslter, as again it's not clear at all that this has to be leather. Plus, I'll add a note about the silver tip being visible on the bottom. Any objections? And, if somone can get me a clear pix of one, that would be ideal, as the CRL shows the telescoping one. yes! first person to get photos in that the LMOs can use also becomes the CRL model. I'll also send a free Phasma coin. How is that for an incentive? OK, let's get this in the July or August CRL thread and get it going. Well, they used to add new clones via paint schemes just to gives us more costumes to worry about. I heard in one instance they made a character's costume intricate just to see how fast it would be before a 501st member created it. So, there you go. We can complain, but it won't change anything, so might as well motor on. Congrats Germain! No one else will ever be the first, and this is a special honor that you will have forever. There was full support for this and it is very well deserved. While "service is its own reward", its still nice that we can say "thanks for all you do" in this fashion. Shoulder bridges -- can I do this? Well, I hear you but the people you'd need to talk to about it are all at LFL. Well, they could and if that's the images they choose to release, and if the LFL person tells us that the images they'll use are red FOTK with a cape, that that's what we have. A writer can create a character, but if the artists depict it differently we go with the visuals. If LFL's reply is "same as FOTK armor, just in red", then I think we should presume they are regular FOTK boots, just in red. What I really want to see is how you'd describe the cape in a CRL. Wow - amazing! You look great These types of costumes are very hard to pull off. Have you thought of asking Mike Appling (TrooperBay)?